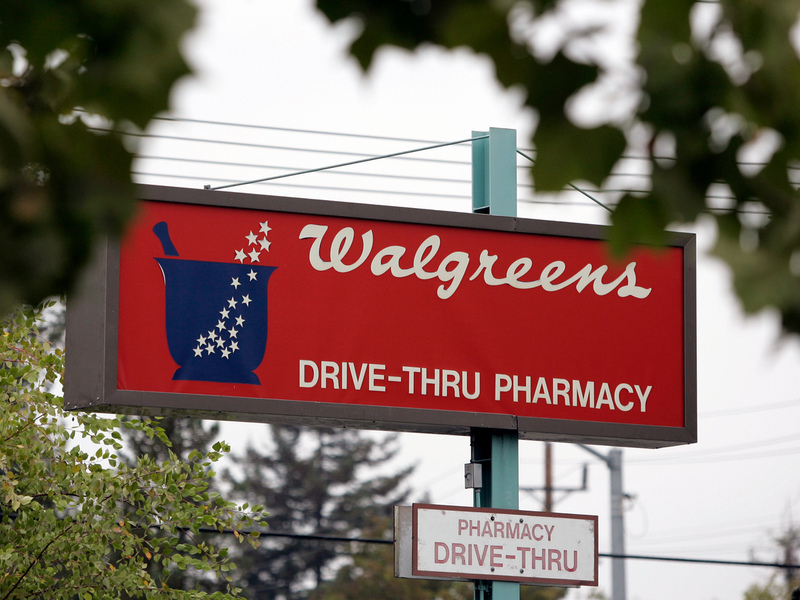 Theranos And Walgreens Fire Alarm In Palo Alto : Shots - Health News A journalist who was interviewing patients about tests that supposedly required only a few drops of blood ran into trouble with representatives from Theranos, the company behind the technology. In 2014, Kaiser Health News' Jenny Gold interviewed patients getting blood tests from Theranos at a Walgreens in Palo Alto, Calif., until a fire alarm stopped everything. It was November 2014, and I was working on a feature story about a hot new blood-testing company in Silicon Valley that promised to "disrupt" the lab industry with new technology. The company, Theranos, claimed its new finger-prick test would be a cheap and less painful way to run tests with just a few drops of blood. Old-fashioned venous blood draws, where the patient watches as vial after vial of blood is collected, would quickly become obsolete, Theranos promised. The interviews took a month to arrange. The public relations officer wanted to know, did I "plan on sourcing other people?" and implied that CEO Elizabeth Holmes might not be available to me if I did talk to other sources. I rejected that condition, and finally the company's public relations people agreed to let me visit their site at a Walgreens in Palo Alto — one of the first in the country — to be followed by a sit-down interview with Holmes at her office. I arrived at the Walgreens on the morning of Nov. 4 and was met by two Theranos press representatives who were there to supervise my visit. I took out my recording equipment (the story was to be for NPR) and began approaching patients who were waiting in line to check in for testing. Some didn't want to talk to a reporter, but others were open and gracious, sharing with me the reasons they had decided to give Theranos a try. One couple offered to let me come with them into the small testing room, set up to feel like a relaxing spa. A pattern quickly emerged: None of the patients there that day were able to get a finger-prick test, as promised. Instead, all of them got a regular venous blood draw, same as I'd received on numerous occasions at my own doctor's office, though the phlebotomist said the needle was slightly smaller. I asked the phlebotomist if this was standard. Did most patients get the venous draw? She told me they "did more finger sticks than venous draws," but couldn't give me a number. One of the company's press people approached me. I was not authorized to talk to the phlebotomist, he said, and asked me to erase the audio I had recorded. I declined. I asked him why none of the patients were getting a finger prick. Just bad luck and timing, he said. This wasn't how it usually was, he promised. And wouldn't I just rather get a finger prick myself and report on the experience, like so many other journalists had agreed to? I said no. I needed an actual patient to make a compelling radio story. So I continued waiting for other patients. Soon, the two Theranos representatives approached me again — with a third, who had set up the interviews, on the phone. She said they were getting complaints about me asking patients questions. The main Theranos office had gotten several calls from people who had been in the Walgreens that morning, she claimed, angry that a reporter was bothering them. I hadn't pressured anyone. The patients had all been perfectly friendly and willing. I've also been a health reporter for 10 years, and never have I been told I was pushing patients to do something that made them uncomfortable. Soon, one of the Theranos representatives approached me again, clearly nervous. They were getting worried. Unless I found a patient getting a finger prick, he said, they would likely have to cancel my interview with Holmes. I asked them to get the woman who had set up the interviews on the phone again. Meanwhile, I sat down with another couple, who had driven 45 minutes to experience the vaunted finger prick. Would they too be steered to a traditional blood test? All of a sudden, as I was interviewing them, a sudden and jolting BEEP BEEP BEEP reverberated through the drugstore. "Fire alarm!" someone called out, and we all evacuated to the street. There was no smoke and no fire. I'd never been in a drugstore when the fire alarm went off. Had someone pulled it? I made a few more calls to various experts on lab testing to try to get to the bottom of the story: Was Theranos for real? I was given an interview with a lawyer at Theranos, who promised me that "significantly more than 50 percent of the tests are done with a finger prick," though she would say no more. I was unable to find out what was actually going on. I decided to cancel the feature. One month later, the New Yorker published another fawning profile of Theranos' Holmes, who was favorably featured in magazines that also included Fortune and Wired. And 10 months after that, John Carreyrou of The Wall Street Journal published the first of his groundbreaking investigations of Theranos, blowing the lid off the company's fraudulent claims. Of the 240 types of blood tests the company said it did, only 15 used the finger prick. Last week, after the Securities and Exchange Commission charged Theranos, Holmes and an ex-Theranos executive with fraud, I wrote the company to ask if one of their representatives had pulled the fire alarm that day at the Walgreens.